So I got on a rowing machine – prefer that anyway! I decided not to go mad. Steve says I don’t ‘do’ moderation! Well I did last night, I went nice and steady for 14 minutes and went nuts for the last minute. 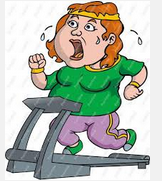 Then did about ten minutes on the treadmill. jelly legs by now so off for a swim – heaven! 2 lengths at 1 minute each followed by one at 55 seconds and a final one at 50 seconds. All followed by a sauna and jacuzzi. Not too bad for a first effort more to come, onward and upward.